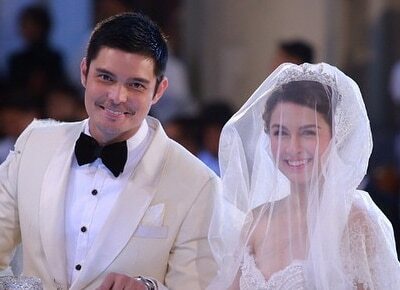 It was a fairytale come true for Marian Rivera and Dingdong Dantes to say I Do in front of their loved ones. The ceremonies for Marian Rivera and Dingdong Dantes were scheduled to start at 3PM but many of the two stars’ supporters were already at the Immaculate Concepcion Cathedral in Cubao early to witness the solemn occasion. Dingdong arrived at the venue riding his Ducati in a white tuxedo by Randy Ortiz. His entrance is said to be reminiscent of his first date with the actress. Also present were the 20 pairs of wedding sponsors including Vic Sotto, Ogie Alcasid, Regine Velasquez, Vicki Belo, Batangas Governor Vilma Santos and Kris Aquino. Child star Ryzza Mae Dizon was the flower girl and KC Concepcion was one of the cord sponsors. Also part of the entourage were Roxanne Barcelo, Anna Feleo, KC Montero and Paolo Contis. Dingdong’s Witness of Honor was President Noynoy Aquino. Other celebrities present were Richard Gomez and wife Lucy Torres, German Moreno, Aiai delas Alas and QC Mayor Herbert Bautista. The ceremony was celebrated by Cubao Bishop Honesto Ongtioco, with seven bishops and seven priests. Marian walked down the aisle with her mother Amalia and her father Francisco, who came all the way from Spain. She wore an ecru French lace, off-shouldered gown, studded with Swarovski crystals made by Dubai-based designer Michael Cinco. The Spanish themed wedding reception was held at the MOA Arena.